Term was over. There were no papers hanging over my head, no exams, no lectures or projects. At least, they could wait until after Christmas. For now, I was free; free from the obligations of being a graduate student that is. Emotionally and mentally I was drained. My personal daemons were plaguing me as I tried to reconfigure my future goals and readjust to my new realities. The news I had received from the States had managed to derail me, but as long as I had work, I had a focus. Now that I was on a hiatus, my brain, a notorious organ of the scumbag variety, began ever so slowly to turn its attention to self-torture. The only thing which could stave off the feeding frenzy was distraction. 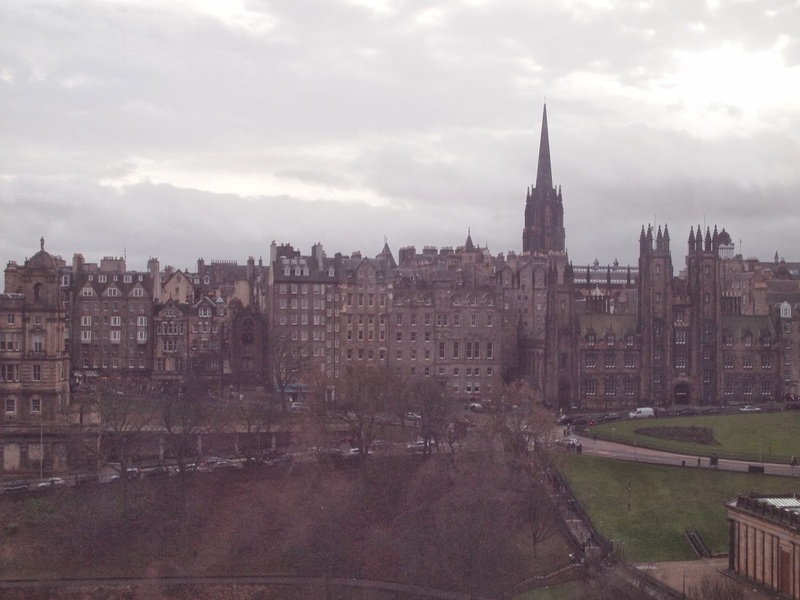 My previously postponed trip to visit Edinburgh was the perfect candidate for the job. 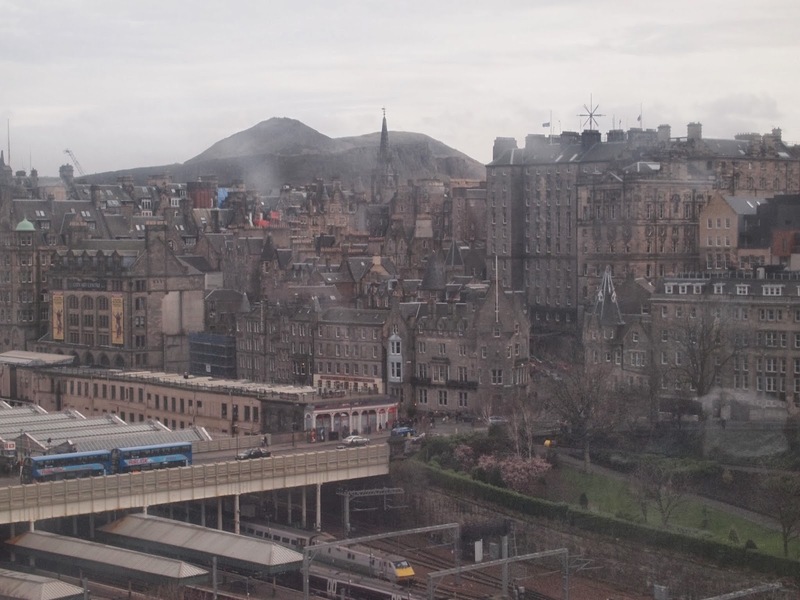 Edinburgh is two hours north by train. Two hours of unstructured, captive time would have allowed my brain to do its worst. I had begun to realise a week before that going to Edinburgh on my own in my present state of depression might potentially backfire. I was delighted to discover that Erin would be there that weekend, stopping off for a day or two before she went back to the US for the holiday. We exchanged numbers and decided to try to meet up once I made it to town. A few days before, Charlotte and I were sitting about in her room. I often ended up back at her place after a lecture or a particularly trying meeting. Her room is far cosier than mine, seeming to embrace you as you enter. We were discussing the upcoming break and our plans when I mentioned going to Edinburgh. She and I had originally discussed going together with the Archaeology Society, but Charlotte had never gotten around to buying her train ticket. She turned to her laptop and discovered that ticket process were fairly reasonable for the same trains I had booked. I had gone from spending the day alone, to having two companions in Erin and Charlotte. I began to breathe more easily and began to look forward to the weekend. The rolling hills of England shifted outside of my window as the train sped north. I followed their undulations with my eyes, up and down, over and under. They became more angular and steeper the further north we got changing from the English countryside into the Scottish highlands. I don’t know precisely when the shift occurred. Nature is no respecter of political boundaries. The earth continued its dance as we neared Edinburgh. Rising ever higher and then quickly plunging down again. Small streams had cut themselves deeply into the land leaving what appeared to be scars running over it. I had never seen anything quite as wild and beautiful. Then we entered the city. 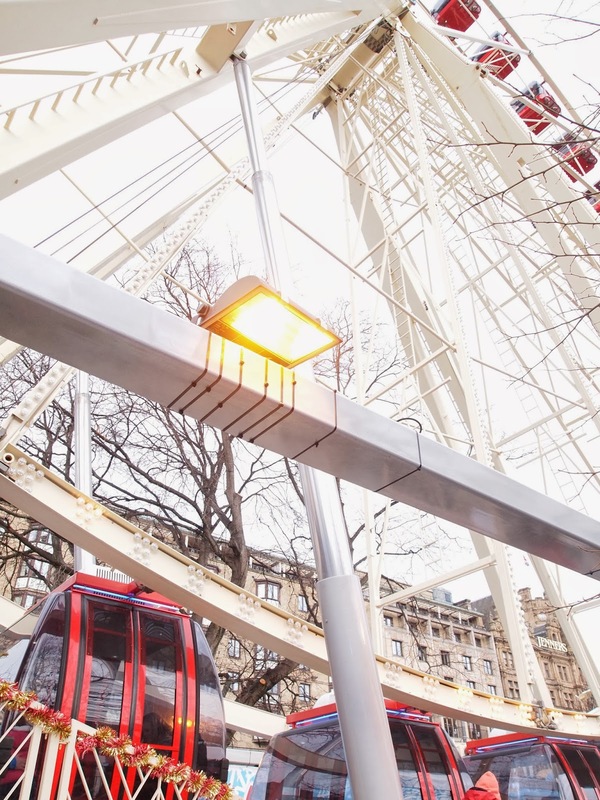 It seems that most cities when entered by train approach from underground. You don’t ever really see it until you emerge from the dark up a flight or two of stairs. 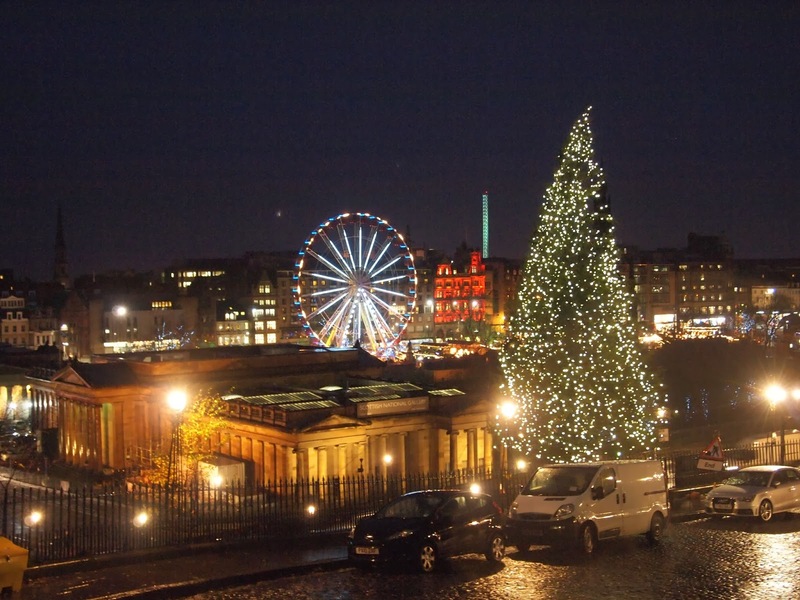 Charlotte and I made our way up from Waverley Station and into the city. 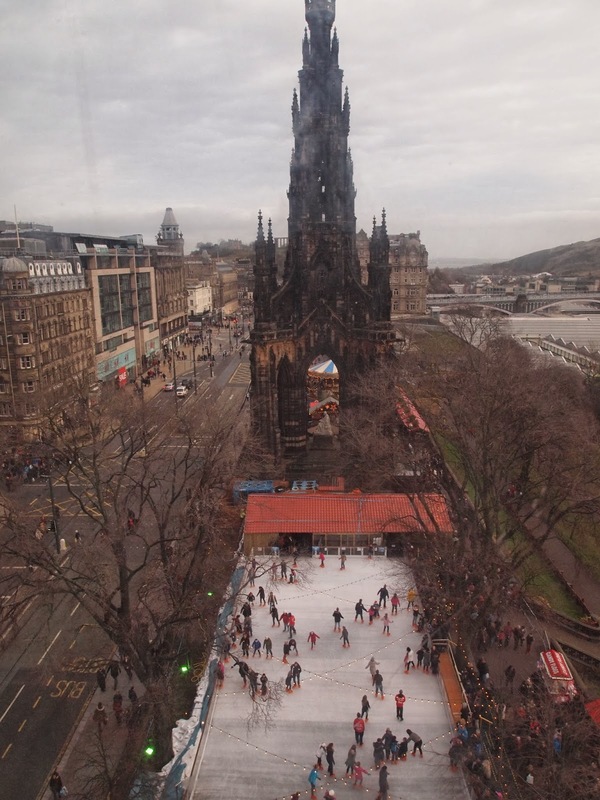 I am still amazed by places like Edinburgh and Newcastle. I had become so used to New York and Philadelphia that whenever I thought of a city, immediately skyscrapers and claustrophobic spaces were conjured up in my mind. 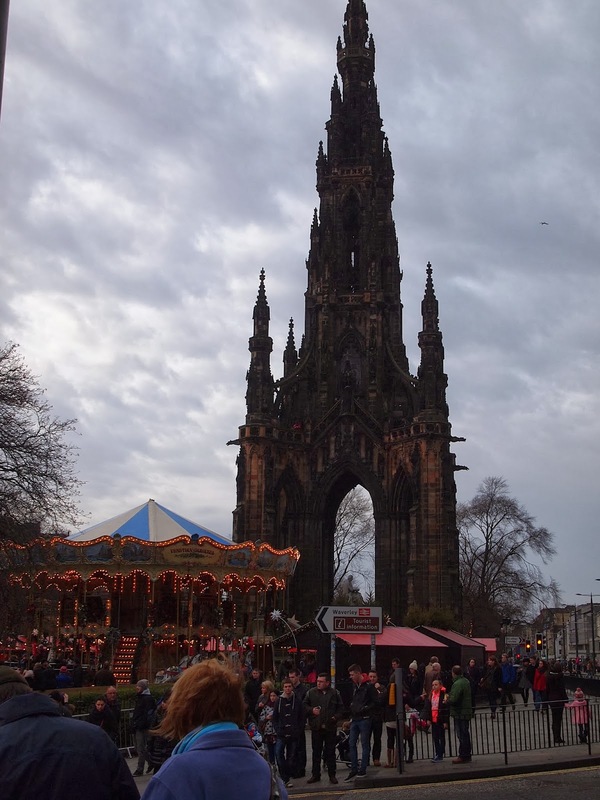 What I saw in Edinburgh though, were tall buildings, but not unreasonable goliaths. They were old, ornate, and established, not new, minimalist, and shiny. Where we were felt wide open and in the distance the castle sat high on a steep bluff. 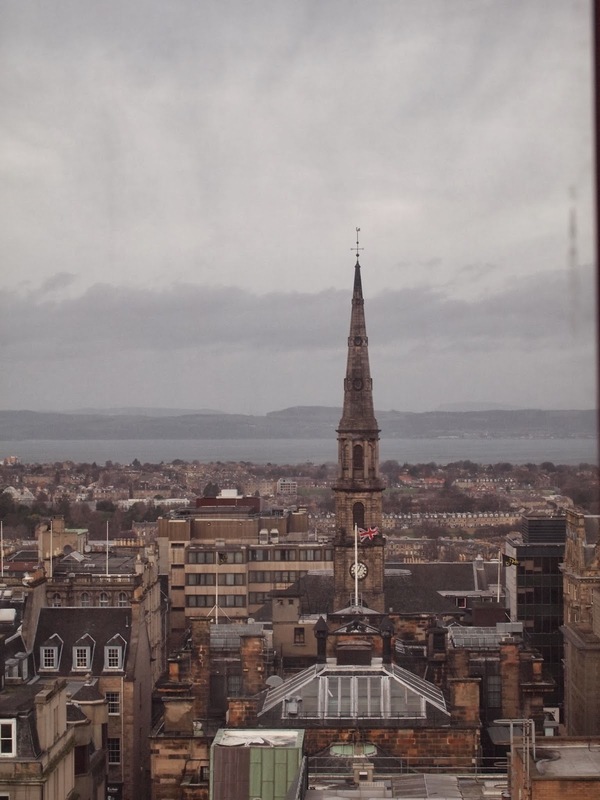 The highlands appeared to melt into the city, or perhaps it is the city that appears to spring out of the highlands. Charlotte and I headed over to the tourist centre, hoping to find where the Christmas market was being held and to find the best way to the castle. We were due to meet Erin there in two hours. After taking out some cash and receiving a wad of Scottish notes (got to love them for being different), we headed towards the market. It was crowded and vast. I’m not entirely sure how the two of us had missed it when we had climbed up from the station. The Ferris wheel and two storey carousel should have been a dead giveaway. 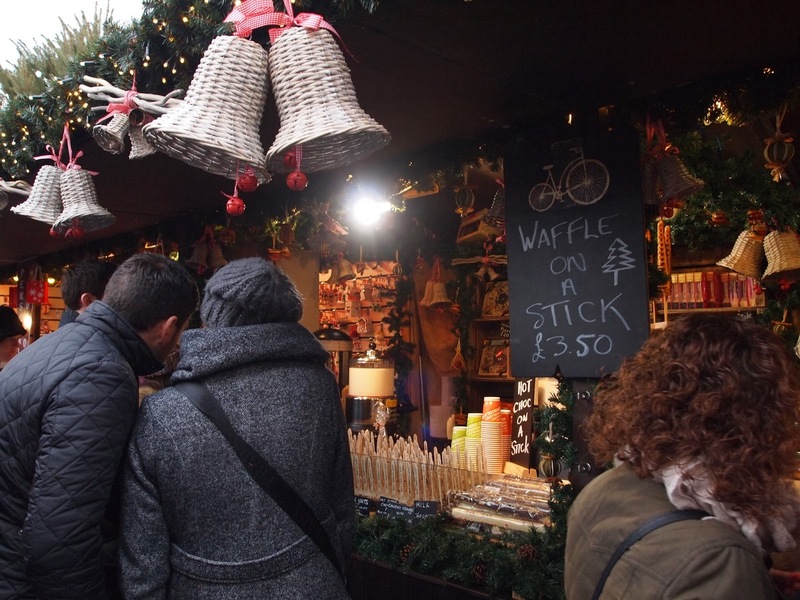 We meandered through the crowd peering at the various stalls. There were trinkets, jewellery, glass ornaments, German candle carousels, cheeses, toys, rag dolls and animals, and bread. Bratwurst and bier were available and we saw passers-by with enormous sausages on rolls. There was an ice skating rink at the foot of the Ferris wheel and a river of people flowed between it all. “I really want to go on the big wheel,” Charlotte said turning to me. Had I been on my own, I wouldn’t have even thought to go up on it, but I looked up and thought that there would be no better way to see the city. I nodded and we got in line. It wasn’t cheap, but once we got to the top, the view made it all worthwhile. After we came down to earth, we decided to make our way to the castle. Neither of us really knew the city and we wanted to give ourselves plenty of time to get lost and found again if necessary. 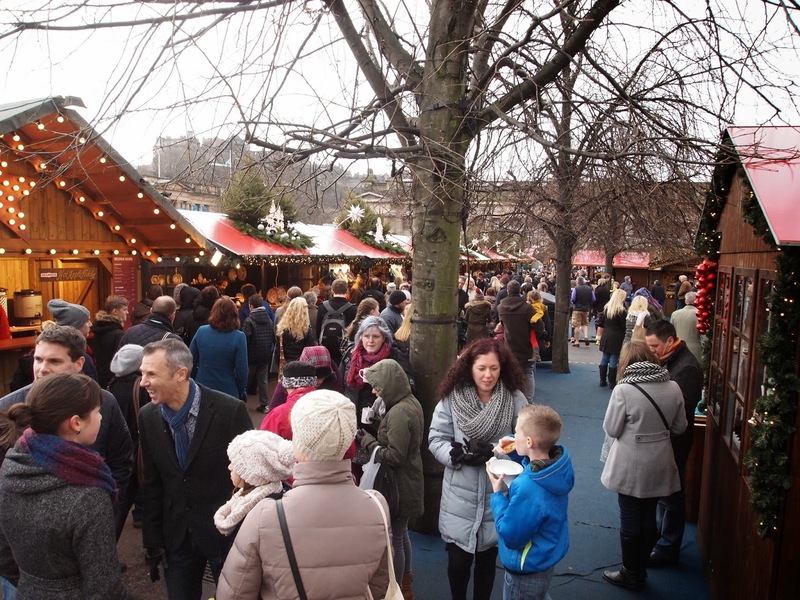 The Christmas Market was truly vast. As we passed the National Gallery, we noticed a miniature train and Christmas tree maze just below us. We continued to head towards the castle. You couldn’t miss it really. Like Durham Cathedral it was omnipresent. We finally made it up onto the Royal Mile and began heading out over the open cobbled courtyard which led to the castle wall. High up on that exposed bluff, there were no buildings to prevent the wind from knocking us almost the ground. We neared the edge and realised how inadequate the stone walls would be should you lean just slightly too far over. We passed through the stone archway and into the grounds. It was all stone and the round walls loomed up heavily in front of us. The price of admission and our meeting time with Erin prevented us from getting much further than the shop. Tartans, St. Andrews golf balls, stuffed Nessys and all the tat of Scotland are available to would be consumers. 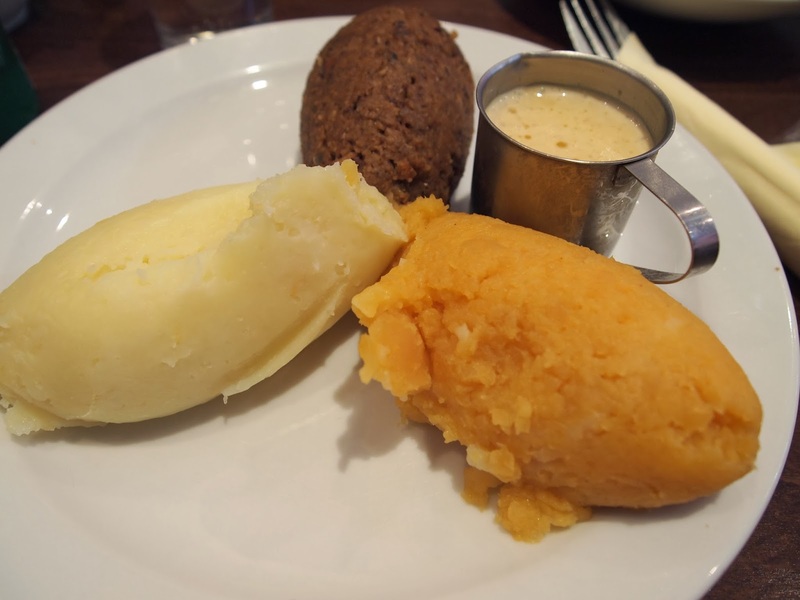 The haggis is the brown blob. After we finished we set off down the Royal Mile towards Holyrood Palace. We were hoping to make it there before dark. 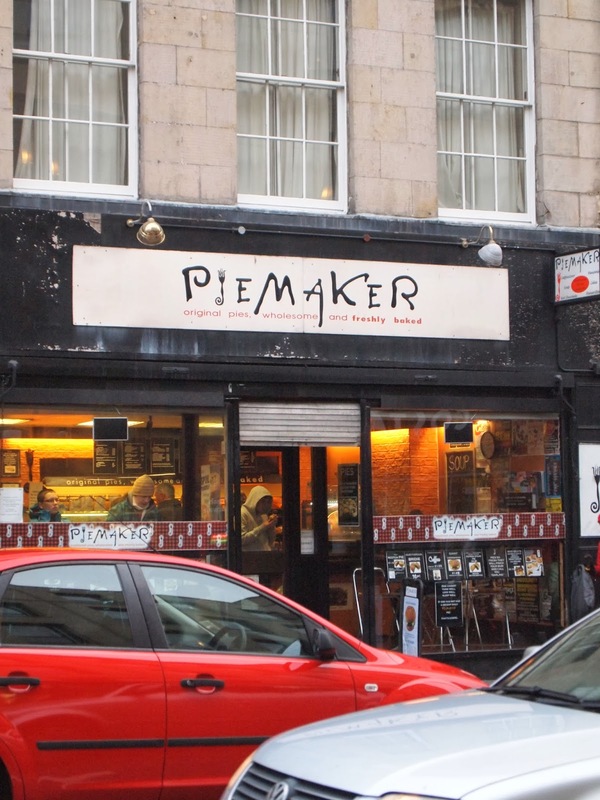 On our way we stopped off at the Pie Maker which had been strongly recommended to us by Alex. Charlotte came away with two meat pies. After a few obligatory references to Sweeney Todd, we continued past the Heart of Midlothian which marked the ancient entrance to a prison. It was covered in wet dabs as though it had been raining. Traditionally, you see, you are supposed to spit on it. Eschewing tradition, we continued down the road. Tartan shops were on every corner and even in between. They are like those souvenir shops in New York that sell I ❤ NYC shirts, only in Edinburgh you buy kilts. I don’t believe there is a barber shop above it. We came upon what at first appeared to be a toyshop. Knowing I had two nieces to shop for we went inside. It turned out to be the Museum of Childhood. The shop in the front sold traditional games and toys while the exhibits were in the rear and upstairs. All of us being in the museum business, we decided to have a look. The displays were old-fashioned and cramped. The cases filled to the brim with the detritus of childhood through the years, dolls, prams, model cars, animal figurines, games. We came upon a nickelodeon and after putting in 50p we were treated to a rather lengthy rendition of Frosty the Snowman. It was well worth the change and as we stood listening, other patrons came over to listen and watch the show. Upstairs we found some more memorabilia from that simpler time of life including a small section of Doctor Who toys and magazines. 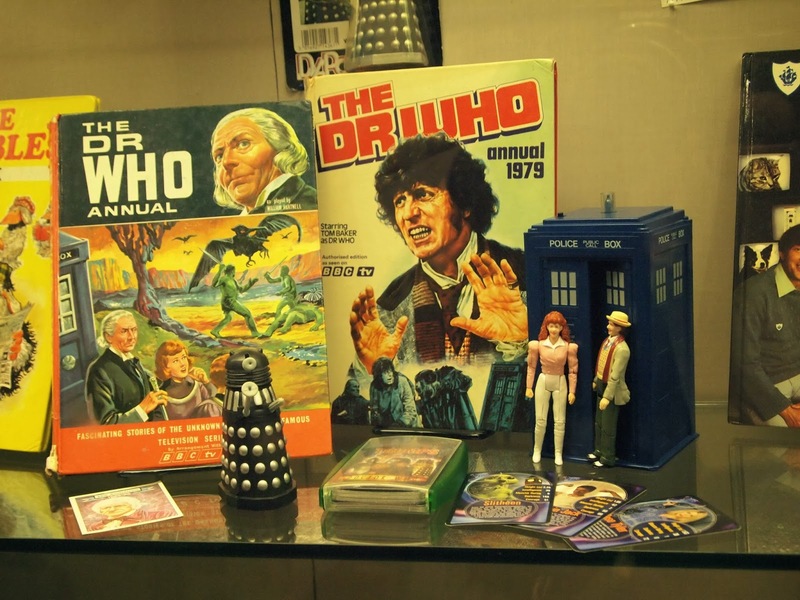 It’s always strange when you see something you own behind the glass in a museum and I was aghast to see a TARDIS play set I had acquired when I was seven or eight. We walked past hobby horses, marionettes, and intricate dollhouses that had running water. It was an odd place, a bit sad really. Perhaps it was the crowded displays or the layer of dust, but it seemed like these happy things of childhood had lost their purpose when they were put behind glass. Yep, totally have that TARDIS complete with Mel. We stepped into the street again and discovered it had begun to drizzle. The light was waning fast though it was only two o’clock in the afternoon. 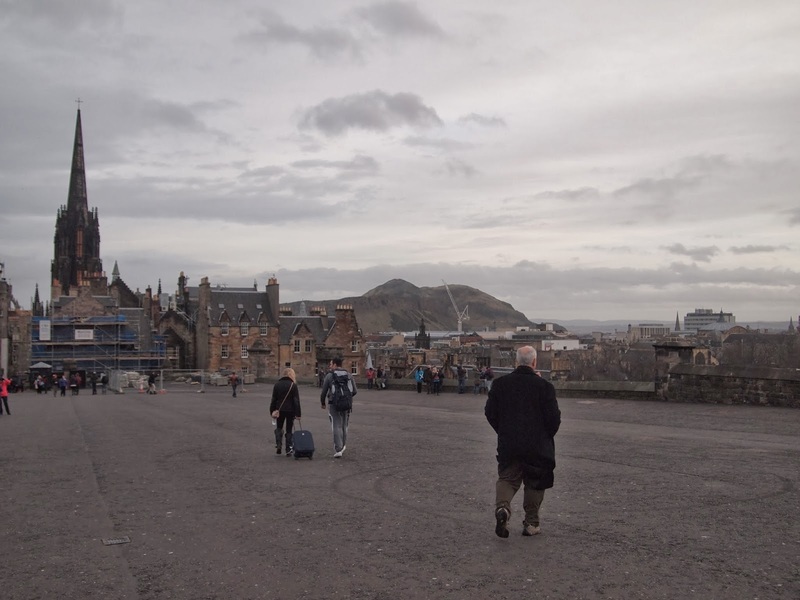 We braced ourselves against the icy rain and continued down to Holyrood. We didn’t get very far. The weather was getting more unbearable the further we went and so we decided to stop in a pub at the end of the world to warm ourselves before continuing on. 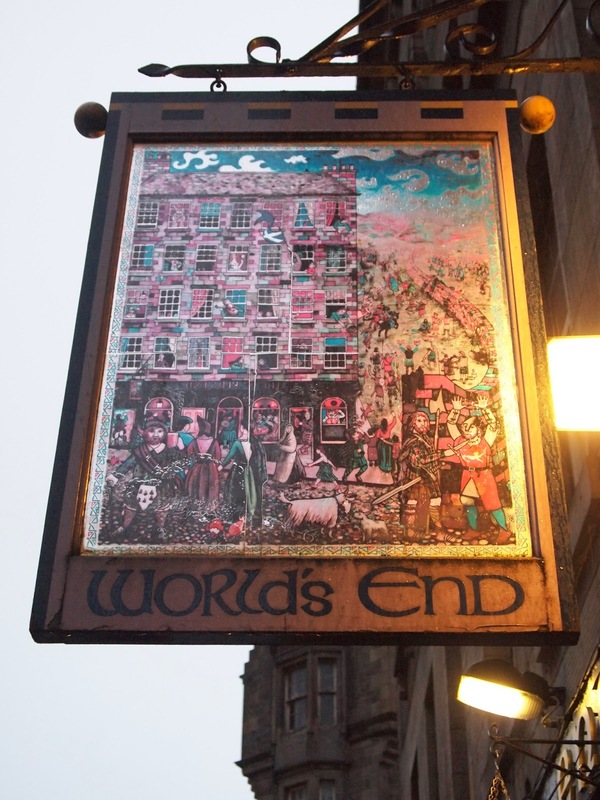 The World’s End pub is a fantastic hole in the wall. It has a lived in, ancient feel that comes from decades if not centuries of wear and tear from the best kind of pub denizens. 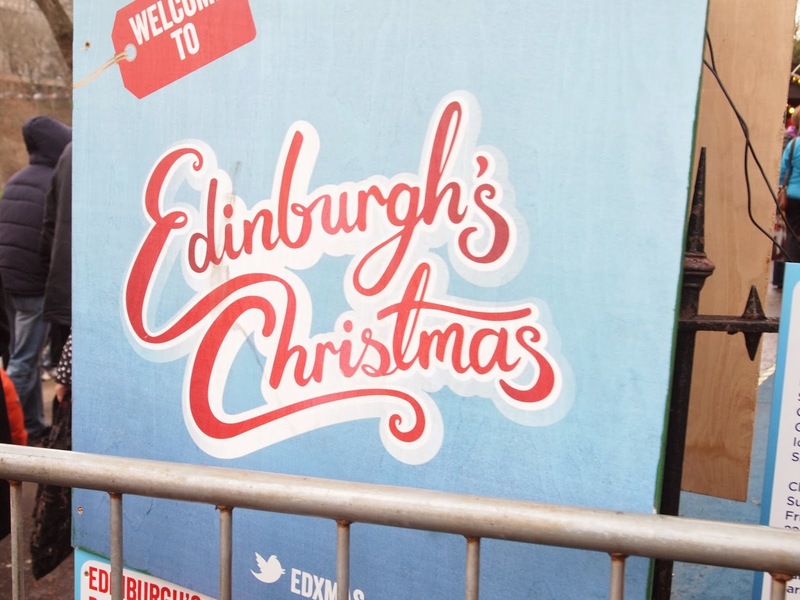 A seemingly odd name, it once truly represented the end of the world, as the people of Edinburgh saw it. 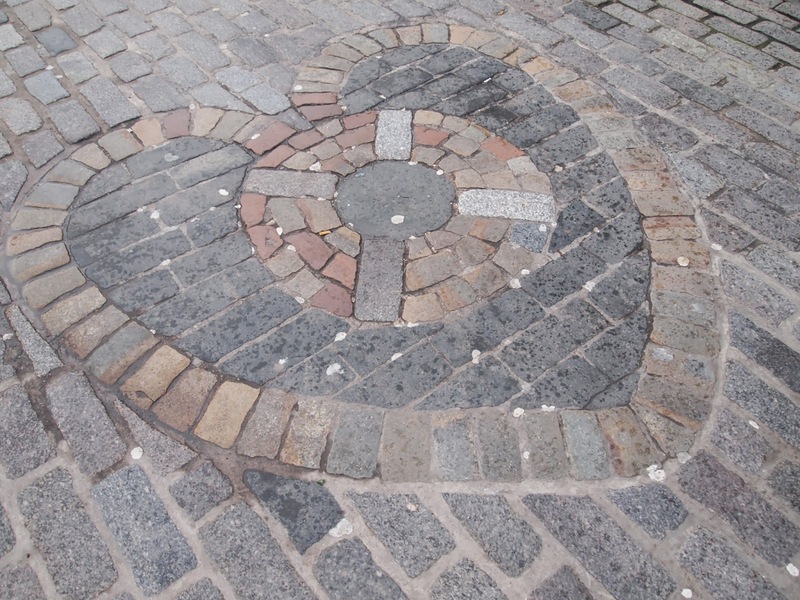 Its foundations are made from the Flodden Wall, a stone defence built in the sixteenth century marking the boundary of the city: the end of the only world the people of Edinburgh knew. We took up three stools at the far end of the bar. Two mulled wines and a Bulmer’s later, we were discussing the end of term, the upcoming holidays, and our plans for the new year. 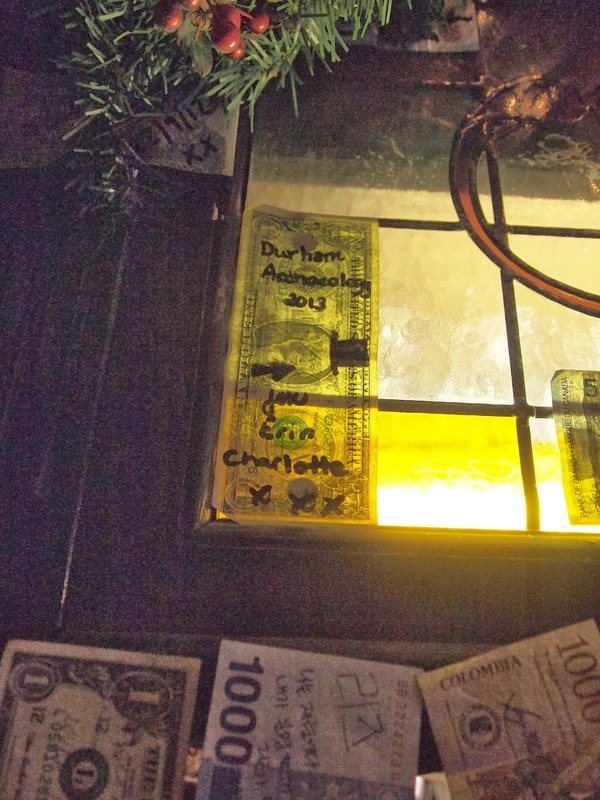 The bar was papered in notes from all around the world, Japan, Brazil, America. Written over them in black Sharpie were messages from travellers who had all found themselves at World’s End. “I wish I still had an American dollar,” I said looking up at the colourful array of capital investment. “I have one,” said Erin pulling out her wallet. “You won’t mind us using it?” I asked. We laughed and asked the barman for a marker. And so, my friends, if you ever find yourself at the end of the world, go to the far side of the bar near the toilets and look up. 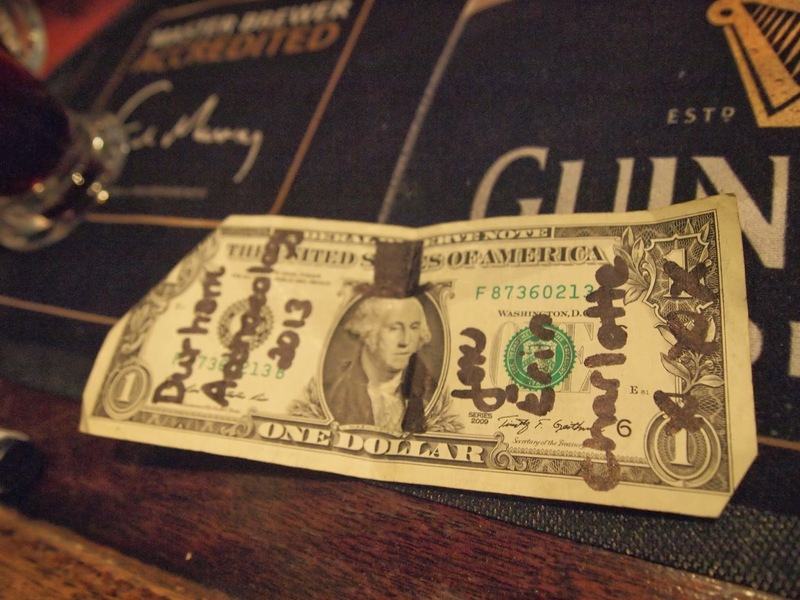 You may just see that very same dollar signed by Charlotte, Erin, and myself. It’s supposed to be an archaeology spade and not an arrow. Fortified against the cold and wet with the best kind of libations, we once again set forth for Holyrood. It was dark now, the sun had retreated behind the highlands and all that remained were the halos around the streetlights and the headlights of oncoming cars. 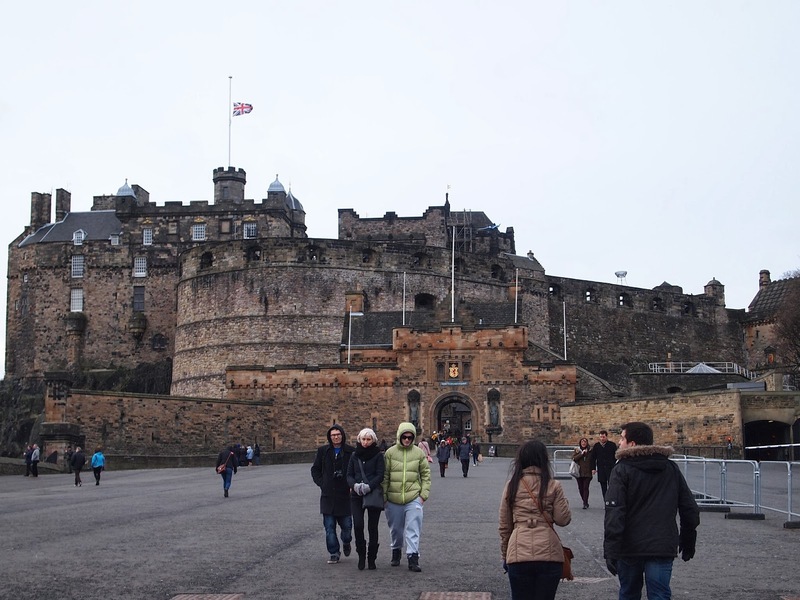 We managed to get to the end of the Royal Mile and entered the visitor’s centre to the palace. It was warm and the lights of the shop cast a yellow glow around all of the goods for sale. To our disappointment the palace itself was closed. We had arrived too late on a Sunday and all that we could do was peruse the exceptionally high priced wares. After staying long enough to warm ourselves and dry at least the outer layer of our clothes, we turned to trudge up the mile back towards the castle. 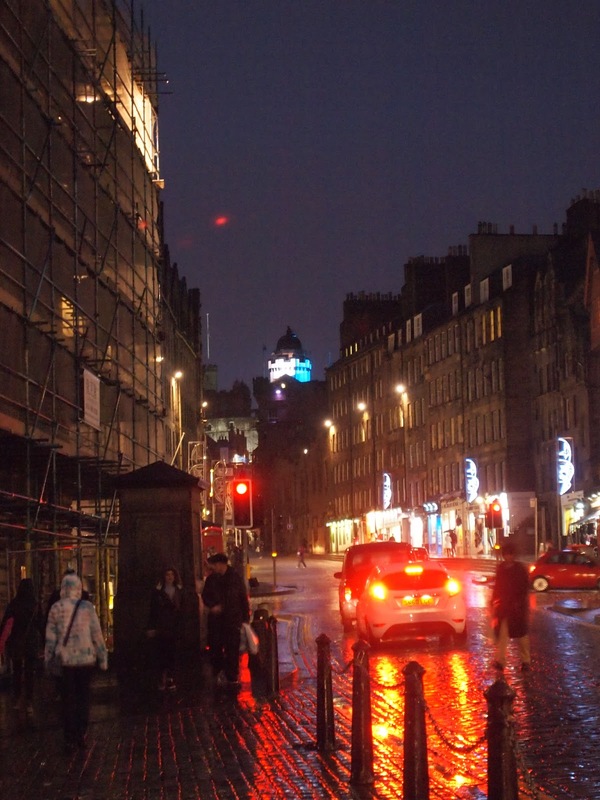 The castle lit in the colours of Scotland. The rain was falling more heavily and the wind was packing a wallop as it rushed between the buildings. We kept our heads down and tilted to the side to keep the water from our eyes. As we passed the blocks of shops I noticed the small alleyways every so often that ran from the street to the backs of the shops and beyond. They were dark and mysterious and were either called closes or wynds. The closes were dead ends while the wynds opened up once you reached its end. Remnants of the medieval city, in the dark and gloom, they made for an even more atmospheric walk back. 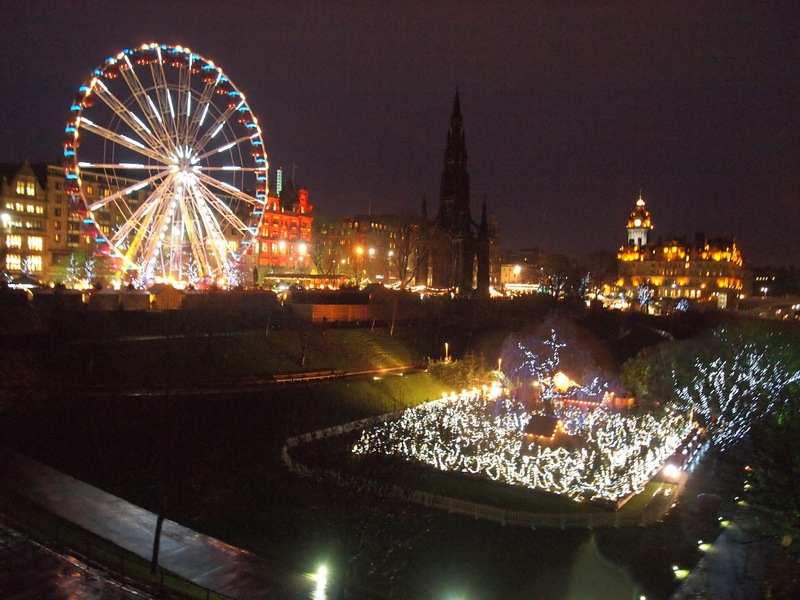 We finally reached the Christmas Market again and saw the glittering lights from atop the Royal Mile. They danced and glowed in the rain like fairy lights. We decided to take refuge in Jenners, the Scottish equivalent of Macy’s on 34th Street in New York. 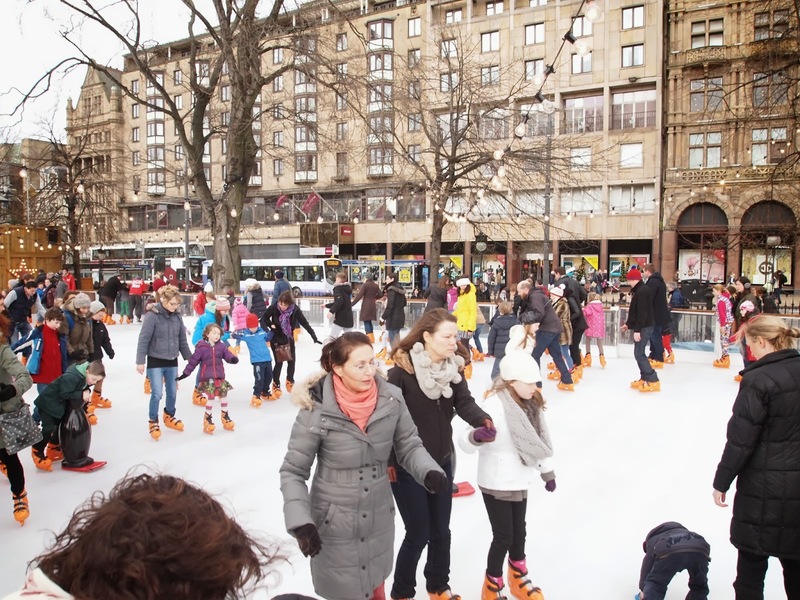 We found a café that looked over the market and happily sipped our hot chocolates while watching the skaters on the ice. We stayed long enough for me to have a second cup and for me to hear and totally misunderstand the heavy brogue of the man behind the counter. We wandered about the market for another hour, buying some gifts and giving Charlotte the chance to finally have one of those enormous German sausage rolls. We walked Erin part of the way back to her hostel and Charlotte and I headed back to Waverley to wait for our train. 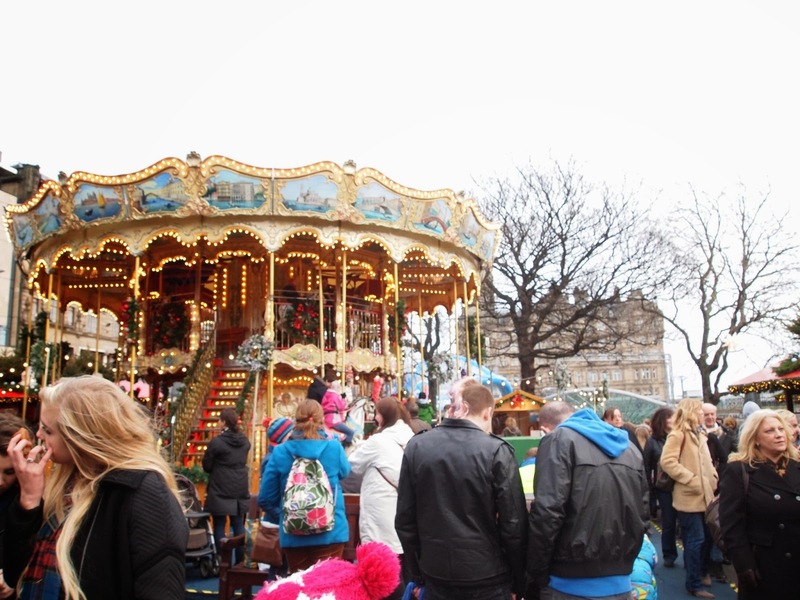 There was much we hadn’t seen or done during our time in Edinburgh. The first visit to a new place always gives you just a little taste, the flavour. 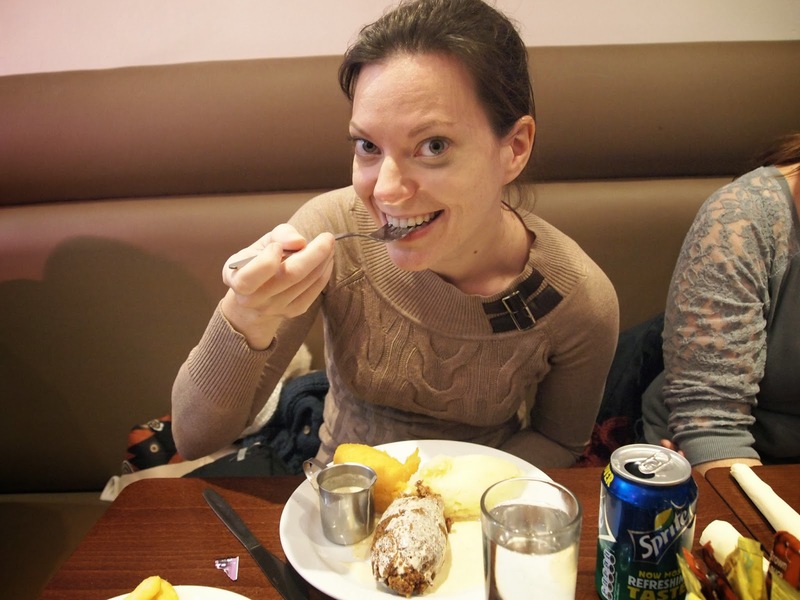 Subsequent trips provide the substance, the meat and potatoes (or haggis and potatoes as the case maybe). I will return to Edinburgh. I will see the castle and the palace. I’ll go back to World’s End and check that our dollar is still there. I’ll roam further afield and explore the underground city. 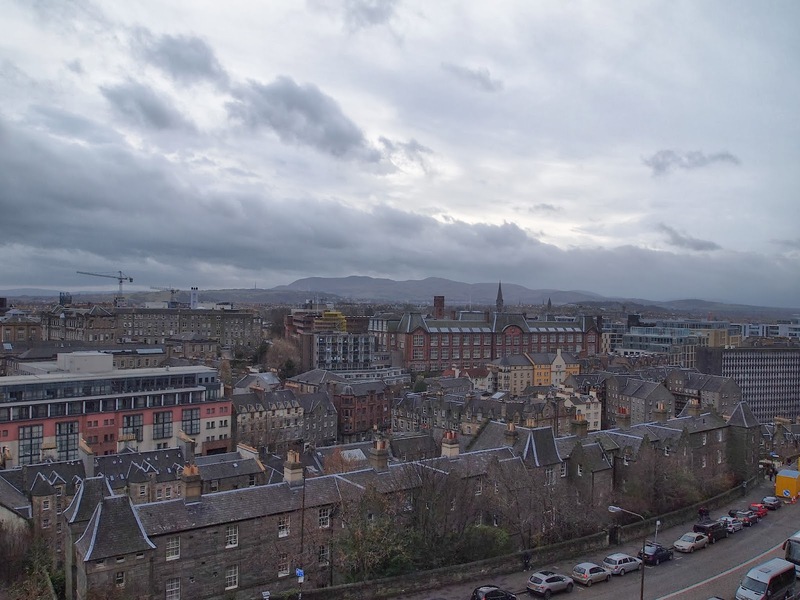 I’ve not quite finished with Scotland’s remarkable city.